How long have you used your WC System? View Poll Results: How long have you used your WC System? I've been running a Maze 1, Hayden Trans Cooler, and 180gph pump for 4 years now, 24/7 365. I usually replace the water once a year. Never had any evaporation or leaks so I've never had to refill it. Maintenance free is my game. I'd like to cut open the block and examine the corrosion inside, but if it still cools well, I see no need. Last edited by HVAC; 10-22-2004 at 03:09 PM. Wow, and thought my maze 3 was old A little over a year for me, ill probably never go back to air either. About two and a half yrs in these waters , changed and added blocks, but pump and rad are still the same. I'm not thinking of going air cooled if I dont really have to, I like it this way. About 40 months I guess. Give or take. Haven't changed the coolant in 18 months, probably won't for another 6 or so (I don't upgrade all that much these days). You mean, "how long have you been using the exact system you're using right now?"...? Some of us change "bits" on a somewhat regular basis. I haven't even been watercooled for six months and I've already switched radiators and waterblocks. I think I might upgrade to an even bigger radiator soon. After my new processor, mobo and DVD burner arrive that is. Same radiator/pump for over two years. Different waterblocks when MBs and processors changed. Usually changed tubing when waterblocks were changed. Current setup for a couple of months, first WC a year and a half ago. same WB for a year now , upgraded the heater core a bit ago. Been study'n water rigs for 2 1/2 years, but have had a rig of my own for less than 2. Over 3 years now for me. Started September 2001. Amazingly, I'm still using the same petsmart pump too , although I had an issue with the trannie cooler I was running (corosion on the alu turbulators that I did not know were in my 'copper' radiator) and replaced it with a heater core. I'm on my 6th different system in 2 yrs. 3 still running, 1 broken down for parts, 2 sold off. I built my first one 6 months ago and its amazing, in use 24/7. i didn't add any additives thinking that i would do it later (silly me, it took me 2 year to build it youda thunk i'd learn that i am not the most motivated person) and the water has turned a brown green color (brown to the naked eye, when a picture is taken of it it turns green) I think it may be corrosion but it did happen all of a sudden after about 1 month of cooling sorta like an algal (sp?) infestation. All i know is that I am not looking forward to cleaning it out, any tips? Count me in, the BeCooling Jagged Edge is a maze block too!!! Air cooled, First time since 2001. It's not noisy, what's wrong? Must be getting on for 3 or 4 years now, still have my maze 2 block! Been watercooling since January 2002. She was running 24/7 until a few months ago when the mobo died. Guess I better replace it with a new mobo. 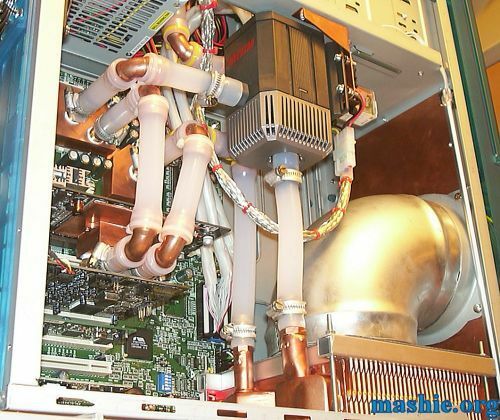 Mashie, I guess that Eheim donÂ´t like being almost the highest point in the loop (looks like a fill/bleed tube in front of the PSU). A lot of 90 degree elbows as well. It was only a minor problem to fill the system the first time but after that it was running like a charm for 3 years, it still would if it wasn't for a dead mobo. The copper bends are fairly soft and with an ID of 15mm compared to 12.7mm in the tubes they don't cause much restriction not to mention the full loop is very short in total.